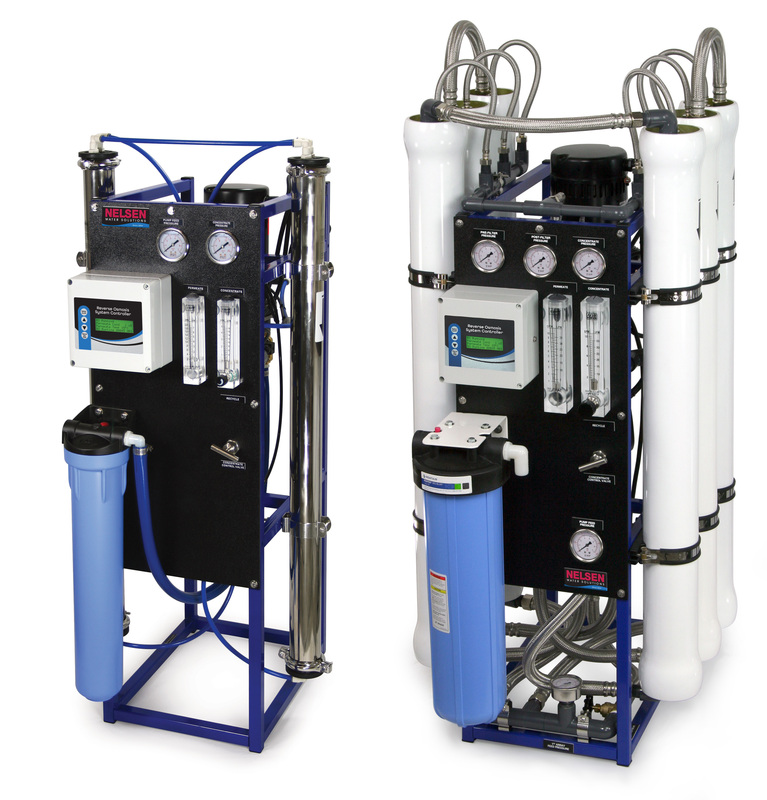 The NRO Commercial Series of Reverse Osmosis systems are built by Nelsen Corporation. These commercial systems of unmatched value in quality and price give you a multitude of standard features that are optional on most other ROs! NSF-grade high quality parts are used to build this tough system. All Nelsen NRO Commercial Systems are wet tested to optimum pressure and production prior to shipment. The NRO 440 Commercial Series is designed for commercial or industrial applications requiring flow rates of 0.17-6.9 gallons per minute (GPM). The NRO Commercial Series features the durability of a powder coated steel frame, a complete performance monitoring package, and simple system integration. Up-gradable design allows for additional membranes to be added to increase production. ?The NRO 2540 Series is designed for Commercial or Light Industrial applications requiring flow rates of 700-1400 gallons per day (GPD). The NRO 2540 Series features the durability of a powder coated steel frame, stainless steel pressure vessels, liquid filled panel mounted pressure gauges, and a rotary vane pump. The NRO SIMPLX Series is a Commercial Reverse Osmosis System that doesn’t cut corners and is engineered to deliver performance and quality. Performance without compromise, this series includes all the essential components necessary to produce quality RO Water in a trouble free and cost effective package. The NRO SIMPLX Series is conservatively rated for Commercial or Light Industrial applications requiring flow rates of 1600 and 3200 gallons per day (GPD). NSF-grade high quality parts are used to build this tough system. Nelsen Corporation has many years of technical experience and service expertise ready to help optimize the performance of your system or build a system to your specific needs!